1. General Filing Rules. Whether you need to file a tax return this year depends on several factors. In most cases, the amount of your income, your filing status, and your age determine whether you must file a tax return. For example, if you’re single and 27 years old you must file if your income, was at least $12,000 ($24,000 if you are married filing a joint return). If you’re self-employed or if you’re a dependent of another person, other tax rules may apply. 2. Premium Tax Credit. If you purchased coverage from the Marketplace in 2018 you might be eligible for the Premium Tax Credit if you chose to have advance payments of the premium tax credit sent directly to your insurer during the year; however, you must file a federal tax return and reconcile any advance payments with the allowable premium tax credit. 4. Earned Income Tax Credit. Did you work and earn less than $54,884 last year? You could receive EITC as a tax refund if you qualify with or without a qualifying child. You may be eligible for up to $6,431. If you qualify, file a tax return to claim it. The estimated tax penalty has been waived for many taxpayers whose 2018 federal income tax withholding and estimated tax payments fell short of their total tax liability for the year; however, there is a catch: the penalty is only waived for taxpayers who paid at least 85 percent of their total tax liability during the year through federal income tax withholding, quarterly estimated tax payments or a combination of the two. Typically, a taxpayer must pay 90 percent to avoid a penalty. The waiver computation will be reflected in a revised Form 2210, Underpayment of Estimated Tax by Individuals, Estates and Trusts, and instructions. This penalty relief is designed to help taxpayers who were unable to properly adjust their withholding and estimated tax payments to reflect an array of changes under the Tax Cuts and Jobs Act (TCJA), the far-reaching tax reform law enacted in December 2017. Although most 2018 tax filers are still expected to get refunds, some taxpayers will unexpectedly owe additional tax when they file their returns. However, the updated withholding tables were not able to fully factor in other changes, such as the suspension of dependency exemptions and reduced itemized deductions. As a result, some taxpayers could have paid too little tax during the year, if they did not submit a properly-revised W-4 withholding form to their employer or increase their estimated tax payments; i.e., a “Paycheck Checkup” to avoid a situation where they had too much or too little tax withheld when they file their tax returns. Please call the office if you need assistance updating your withholding this year to make sure you are having the correct amount of tax withheld for 2019. QuickBooks can help you take all of these steps. It also offers a fifth option: assessing finance charges for tardy remittances. Figure 1: You will need to decide on your QuickBooks Finance Chargesettings before you can begin to apply these late fees. What Annual Interest Rate will you charge? Will there be a Minimum Finance Charge? Do you want to offer a Grace Period? If you’ve never worked with finance charges before, you might be at a loss as to how you should answer these questions. If so, don’t hesitate to call a QuickBooks pro in the office who can help you make sure you’re selecting the correct Finance Charge Account. 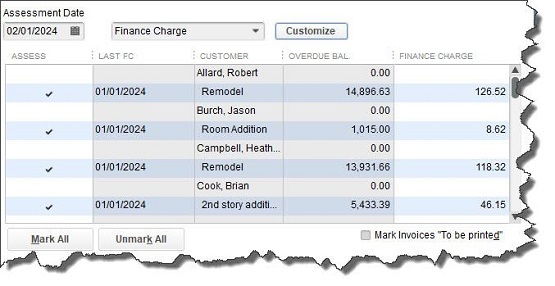 In this example, QuickBooks defaulted to 70100 – Other Income, which may be the best option for you. The next question may require some research. Some jurisdictions don’t allow you to Assess finance charges on overdue finance charges; you’ll need to find out if this is the case. If there’s any doubt, make sure that the box in front of that option isn’t checked. Figure 2: By selecting an Assessment Date, you are telling QuickBooks how many late days should be included in its finance charge calculations. When you are ready, open the Customers menu and select Assess Finance Charges. A window like the one in the image above will open. All you have to do here is make sure there’s a checkmark in front of every finance charge that should be invoiced (the check marks should already be there, but you should verify this). If you send statements, clear the box in front of Mark Invoices “To be printed. “ The finance charges will appear on the next statement. When you are satisfied, click Assess Charges. 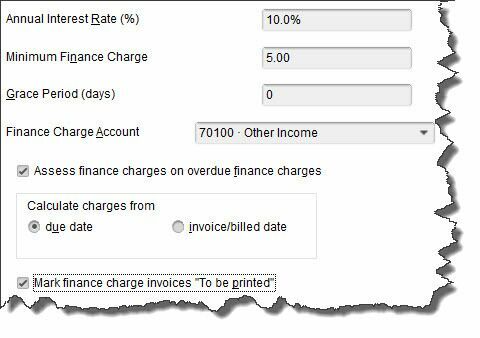 Figure 3: You can see your finance charge invoices when you go to print them. Of course, if you email invoices, you would click on File | Send Forms. It is a good idea to notify your customers before you start assessing finance charges. This will give them a chance to catch up, and no one will be surprised to see the extra invoices. QuickBooks does the heavy lifting as far as calculations are concerned, but it is important that you set your finance charges up correctly. Customers will be annoyed by mistakes, and it is much easier to get this tool set up right from the start than to have to go in and untangle errors. If you plan to start assessing finance charges but aren’t sure how to proceed, please call the office for assistance. Employers – Social Security, Medicare, and withheld income tax. File Form 941 for the fourth quarter of 2018. This due date applies only if you deposited the tax for the quarter in full and on time. Farm Employers – File Form 943 to report Social Security and Medicare taxes and withheld income tax for 2018. This due date applies only if you deposited the tax for the year in full and on time. Certain Small Employers – File Form 944 to report Social Security and Medicare taxes and withheld income tax for 2018. This tax due date applies only if you deposited the tax for the year in full and on time. Employers – Nonpayroll taxes. File Form 945 to report income tax withheld for 2018 on all nonpayroll items. This due date applies only if you deposited the tax for the year in full and on time. Employers – Federal unemployment tax. File Form 940 for 2018. This due date applies only if you deposited the tax for the year in full and on time. All businesses. Give annual information statements to recipients of certain payments made during 2018. You can use the appropriate version of Form 1099 or other information return. This due date applies only to payments reported on Form 1099-B, Form 1099-S, and substitute payments reported in Box 8 or gross proceeds paid to an attorney reported in Box 14, respectively. Individuals – If you claimed exemption from income tax witholding last year on the Form W-4 you gave your employer, you must file a new Form W-4 by this date to continue your exemption for another year. Employers – Begin withholding income tax from the pay of any employee who claimed exemption from withholding in 2018, but did not give you a new Form W-4 to continue the exemption this year. Businesses – File information returns (for example, certain Forms 1099) for certain payments you made during 2018. However, Form 1099-MISC reporting nonemployee compensation must be filed by January 31. There are different forms for different types of payments. Use a separate Form 1096 to summarize and transmit the forms for each type of payment. See the General Instructions for Certain Information Returns for information on what payments are covered, how much the payment must be before a return is required, what form to use, and extensions of time to file. Payers of Gambling Winnings – File Form 1096, Annual Summary and Transmittal of U.S. Information Returns, along with Copy A of all the Forms W-2G you issued for 2018. If you file Forms W-2G electronically, your due date for filing them with the IRS will be extended to April 1. The due date for giving the recipient these forms remains January 31. Health Coverage Reporting – If you are an Applicable Large Employer, file paper Forms 1094-C, Transmittal of Employer-Provided Health Insurance Offer and Coverage Information Returns, and 1095-C with the IRS. For all other providers of minimum essential coverage, file paper Forms 1094-B, Transmittal of Health Coverage Information Returns, and 1095-B with the IRS. If you are filing any of these forms with the IRS electronically, your due date for filing them will be extended to April 1. Farmers and Fishermen – File your 2018 income tax return (Form 1040) and pay any tax due. However, you have until April 15 (April 17 if you live in Maine or Massachusetts) to file if you paid your 2018 estimated tax by January 15, 2019.